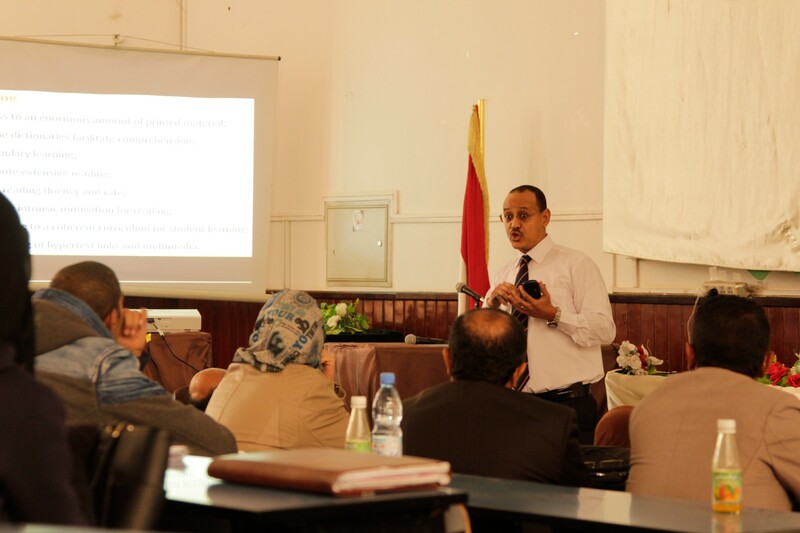 As a Fulbright alumnus, I was able to implement a Computer-Assisted Language Learning Project (CALLP) targeting Yemeni English as a Foreign Language (EFL) teacher educators and student teachers in the English Language Teacher Education Programs (ELTEPs) in four public universities, Sana’a University, Dhamar University, Ibb University, and Hodeidah University. I was able to successfully bring CALLP to life with the support of the Fulbright Alumni Community Action Grant, which set the project in motion. Without a doubt, being a member of the Fulbright alumni community comes with great privilege, one of which is receiving support for projects to further use our knowledge and skills to serve our communities. The CALLP project, similar to other Computer-Assisted Language Learning (CALL) efforts, calls on using applications of the computer in language teaching and learning. My goal was to familiarize the participants with CALL and the significance of its integration in ELTEPs. Through the project, I had the chance to learn about the different ways CALLP participants viewed the urgency and challenges of CALL integration into ELTEPs. CALLP provided me with an opportunity to expose the participants to some of the latest expediencies of language learning such as Social Networking Sites (SNS) — Facebook, YouTube, Blogs, Forums — Learning Management Systems (LMS), and Massive Open Online Courses (MOOCs), etc. Additionally, I administered a survey at each university after the workshops, and the overall results indicate that the participants had positive perceptions toward CALL. I plan to publish the results in an academic journal in the near future, hoping to further enrich the current research of CALL. This project also provided me with the chance to share my experience of living and studying in the United States to CALLP participants. My journey with Fulbright started with pursuing my MA/TESOL at Murray State University in Kentucky. This experience helped solidify my background in ESL/EFL instruction and teacher education. It widened my perspective on many English language teaching (ELT) trends. Additionally, it bolstered my knowledge and skills, serving as a catalyst for my further doctoral studies in India. During the orientation sessions, I highlighted how living and studying in the U.S. influenced my personality and professionalism. I was pleased that the participants were interested to know more about college life in the U.S. They asked a number of questions related to the American educational system at the college level, curriculum, tuition, food, sports, pastime activities, etc. Overall, due to good planning, organization, and communication, the CALLP implementation was a great success. The turnout of the intended participants for the CALLP workshops was remarkable. I feel satisfied knowing that the CALLP goals and objectives were eventually achieved by the participants. I felt extremely happy seeing that the participants demonstrated an eagerness to learn about CALL through their active participation and interaction in the workshops. I am highly appreciative of the cooperation of the people in charge at the selected universities — Rectors, Vice-Rectors, Deans, Vice Deans, and HoDs. Of course, I am also thankful to the participants for sparing their time to join the CALLP workshops and the student volunteers, who provided help by distributing flyers, distributing beverages, hanging banners, and taking photos. Finally, I am grateful to the Fulbright Program for their generous support in funding CALLP. Mohialdeen is a Yemeni Fulbright Alumnus who graduated in 2006 from Murray State University with a Master’s in TESOL. Dr. Alotoumi’s CALLP ran from January 1 to April 5, 2018.